The meeting stands out as unique among nearly a year of entries on van der Vaart's calendar, and a spokesman for McCrory could not furnish examples of similar mealtime sit-downs with other large companies. So last June 1, Governor Squishy invited the top brass of Duke Energy to his house, to sit down and sup at his table with his top environmental regulators, all the while publicly he was growling menacingly about making Duke Energy clean up its messes (plural) across the state, not least of which was the monstrous coal ash spill into the Dan River. 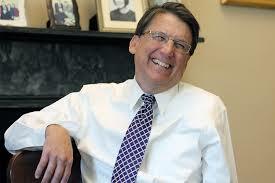 McCrory was elected the Governor of North Carolina, but he has continued to behave like the Prize Sow of Duke Energy. It ain't funny.